DD-WRT Forum :: View topic - Netgear WNR834Bv2 - is it supported? Netgear WNR834Bv2 - is it supported? Posted: Sat Oct 06, 2007 0:30 Post subject: Netgear WNR834Bv2 - is it supported? I've dug around here, searched the wiki and the forums, and haven't been able to come up with anything that references v2 specifically of the WNR834B. I have seen some mention of work on the WNR834B v1, and was wondering whether it would be reasonably safe to try DD-WRT on my shiny new v2. Also, while I'm sure the DD-WRT devs are probably aware of this, I figured I'd point out that the WNR834B v2 (along with many other Netgear routers) firmware source and toolchain are available under the LGPL license here on Netgear's site. I don't know how useful it is to you guys as I don't know squat about writing firmware, but thought it might help. First you can open the box and look inside. You can also post some pictures of inside. hmmm, I guess i'm going to have to wait until someone else gets a hold of one then and can open it up... it's got warranty stickers over two of the screws, and upon a little gentle experimentation they're the kind where the metallic foil peels off from the back leaving the word "VOID" where it was originally stuck. Additionally, the screws are T-5 torx, which I don't readily have a screwdriver for (the smallest I have is T-10), although that problem could be alleviated were it not for the warranty stickers. I'm still contemplating returning the router for another model (possibly Netgear, possibly another), so I don't want to do anything that would eliminate my return capability. If I were to return it, can anyone suggest any good draft-N routers that DD-WRT is known to work with that aren't too hard on the pocketbook (I'm looking around the $100-130 price point)? Posted: Sat Oct 06, 2007 9:55 Post subject: Well..
Anywayz... Go Ahead And Try DD-WRT.. Its A Great Product! If Netgear Would Upgrade The Firmware Once And Awhile I'd Still Be Using It.. But For Now, DD-WRT Is The Answer. Caution: I Mentioned This Before.. And Its Probably Fixed.. But I Had Difficulty With Certain Firmware Updates. As Of Now, I'm Using v24 Beta (07/04/07) mini But I Plan To Update Soon.. This Weekend No-one Will Be Using The Network So Its A Perfect Time To Update Firmware.. Get Everything Back Up And Running As Normal. Be Sure To Use The Beta Firmware.. v23 Wasn't Quite Compatible For Me..
And Lets Say.. The Firmware Isn't Compatible.. You Could Always Reflash Netgear Firmware! Start Off With dd-wrt.v24_mini_generic.bin If That Works.. You Could Go For The VoIP Firmware, Which Isn't Really Necessary. After You Get The Firmware Loaded.. Make Sure All Your Devices Can Connect And Internet Works.. If Everything Is Good.. Spend An Hour Customizing Your "New" Router! One Thing I Did Right Off The Bat Was Turn On QoS, Gave My Xmit Power A Little Boost (Not Too Much.. You Could Get Brain Cancer D: ) Disable Frame Burst, Disable CTS Protection Mode, And Disable Afterburner. Any feedback regarding this? I've still got a few days in which I can return this pretty much no-questions-asked, and would like to do so if there's something better out there. Sorry to bump this, but it seems to have fallen to the third page* and I've only got until Saturday according to my receipt to return the WNR834Bv2, so if someone can recommend a good draft-N router that's compatible with DD-WRT for <$130 before then, I'd appreciate it! The radio was changed from cardbus to onboard intensi-fi, and a third antenna was added. V2 still uses a BCM4704 processor, BCM5325 switch, and has the same flash and ram capacity. On a side note, Sveasoft warns "WARNING!!! Netgear has crippled the latest WNR834B models and rendered them incapable from recovering from a flash failure. A flash failure of any firmware (Netgear's or ours) WILL PERMANENTLY BRICK YOUR ROUTER!!! Flash at your own risk." I wonder if they're talking about v2 or later versions of v1. edit: Incidentally, I noticed Netgear moved to a new format with a new extension (.chk) for their v2 firmware files. I'm unable to open it as an archive or extract the contained .bin like I was with the v1's .img files. Do you think it's likely to flash and run using the latest RC? No idea, normal way would be to get flash copy by jtag first. What is the Flash chip in this by the way ? 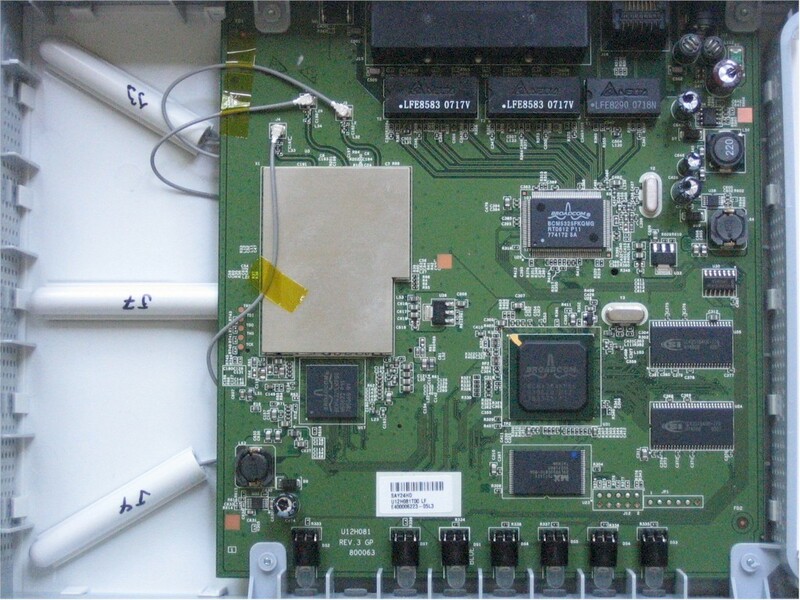 The radio is BCM2055 and the MAC/baseband controller is BCM4321. Picked up one of these today to play with. Tftp doesnt run at boot, so I intentionally bricked it. After bricking, tftp does load and I can up any firmware i want to it, but nothing will run except authentic netgear. When i up auth firmware the power light turns solid orange and it starts loading up. For other firmware the power light just blinks green, stays solid green, or turns off as soon as the up finishes. Tftp no longer functions until i reboot it, and it stops responding to ping.